Prelude from Dancing Dolphin: As I sat down to take a message this evening, I asked my H.S. "Who would like to give me a message for the Lightworkers of Earth?" Almost instantly, I felt Mother God's incredible presence! My stomach started tingling big time with energy, my eyes began watering with joy and so much energy was pulsating through my arms that my hands were shaking. Wow! Yes, dear heart, this is Mother God and I do have a message for the Lightworkers of Earth and for all my Children of Earth. My children, the time has come for me to send the final wave of my tsunami of love, of what you are now calling “The Event.” For in truth, I have been sending this wave of brilliant love light for a couple of years now but had to tone it down so I wouldn't overload your systems. I have asked this One to bold the sentence in the above paragraph because that is what I wish to discuss with you tonight, this very night. So again I say, The time is now right for me to send the final wave of my tsunami of love to Earth, to YOU! I am joyful and thrilled that you all have adapted so well to the preliminary waves that I have been sending you. It was vital that you adjust first to these energies before more could be sent. Many other triggers or events had to happen in line also as you can imagine. But the careful, meticulous planning by the Company of Heaven and your Galactic Family and implementation by the Alliance of ALL OF YOU combined—the Company of Heaven, Galactics, Lightworkers, StarSeeds, Inner Earth & Hollow Earth families and of course, Gaia and all her Kingdoms have made this final wave of love light possible. You are all doing it together, dear children! I am pouring forth my love light into the Soul of this One as we speak and let me say—she feels it! The tingling in the stomach, tears of joy, shaking of the hands, the overflowing love in her heart—YES!! My final wave will simply flood your Being with everlasting unconditional love which will wash clean all that no longer serves your highest good. There is absolutely no reason to fear this wave of love light dear Children! Depending upon where you are when it reaches you, you may or may not see it coming. If you are outside, you may see brilliant colors in the sky flowing towards Earth. It will be a beautiful sight! If others are concerned or become afraid, please comfort them with the knowledge that it is Divine Mother's love coming to Earth. If you are inside (and possibly sleeping) when the wave washes over you, you will feel joy, excitement, contentment, ease and my unconditional love. 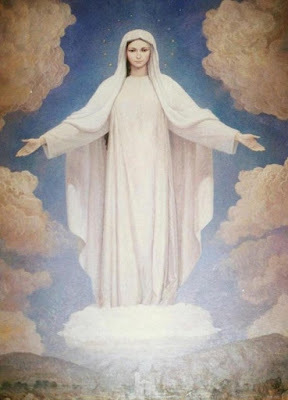 If your family becomes alarmed in any way; again—please do comfort them and reassure them that this wave of love was sent from their Mother God. Your world and lives will change greatly after the wave passes. Go slow, follow your hearts and you will know which path to take. Of course, many other events will follow in short order. You are always protected and loved, dear Children; and you may call on myself, your Father God and/or all our Angels and Ascended Masters for guidance if you wish. I will be sending further updates through this One shortly. She has asked to receive Messages of Love for the Lightworkers of Earth and so I am very pleased to have this communication with you, my Children. This is the time that you all have been working towards for millennia. Please relax and enjoy this experience! Your stories will be told for generations to come. Rest now with my love. Please feel free to share. My blog is always free.